Today marks the return of spring street cleanings, which means that you will once again need to pay attention to your neighborhood’s street cleaning rules. Failure to do so is a $30 ticket, and you know you don’t want one of those. 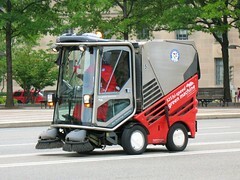 Worse: the street sweepers in DC are camera equipped with license-plate recognizers which means you’re probably going to get a ticket-by-mail. I don’t know what it is about tickets by mail, but I only tend to get the second notice with the higher fine, so be careful and just move your car ahead of time, okay?